If you’ve never been to the northwestern reaches of the United States, you should really go give Oregon a look. There’s a ton of really awesome nature spots, like Crater Lake. It’s the deepest lake in the USA. We dipped our head in, one time, it’s breathtakingly cold in that water. Ok, nature time’s over, back to schools now! Getting a college degree is a great opportunity to thrust yourself into a new experience and start with a clean slate. Why not explore a place you’ve never been in the process? 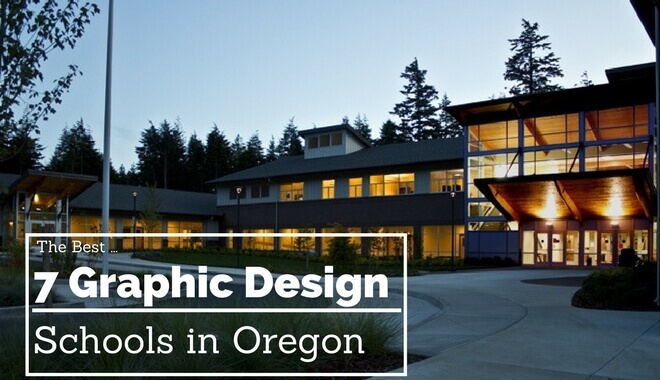 We’ve put together a list of the top 7 graphic design schools in Oregon in an effort to make your search for higher education just a little bit easier. If you’re considering Oregon, or just considering graphic design, this list is a great place to start. We look at a number of elements when choosing schools to list: tuition pricing, quality of the design program, faculty accessibility, and overall school quality. The schools selected for our list are top performers in at least one of these areas. Communication Design is a challenging course, but it will prepare you for the toughest visual communication problems in the professional field. Your career possibilities could expand as a result of communication design’s expanded reach. The graphic design courses at the Art Institute of Portland were designed by focusing on the skills you’ll need as a student, an educator, or a professional. The Graphic Design Program will expose you to courses like Color and Design Fundamentals, Layout and Concept Design, Digital Illustration, and Interactive Motion Graphics, to name a few. The Graphic Design concentration at The Art Institute of Portland will expose you to Advertising Concepts, Art Direction, Business of Graphic Design, Form and Space (advanced layout) Design, and more. These Art Institutes are located all over North America, so you can look for one in a state near you! Located in the great city of Portland, Portland State University dishes out design theories, principles, history, practice, and applications through their BA/BS Graphic Design program. After your first two years in the Graphic Design program at Portland State University, you’ll have to undergo a Sophomore Portfolio Review. In order to continue on with your 300- and 400-level courses, you need to pass this review. If you fail to pass the review, you can’t progress further through the program. If you’re up for the challenge, Portland State University is a fiscally reasonable option to explore. State residents have tuition of just under $4,000, and non-residents can expect a tuition of just over $12,000. Your first year will include instruction in basic design and basic art courses. Your second year brings in elements of critical design thinking, helping you to creatively solve visual communication problems. Your junior and senior years free you up to select courses with increasing specialization. Portland State University provides opportunities for you to nab professional internships (not without some competition), and flesh out your professional portfolio (Sophomore Portfolio Review was just the beginning). The undergraduate certificate program takes just 9 months to complete. The program only costs $4,326 for tuition and fees, with another $1,560 required for books and supplies. There is no on-campus housing, and no boarding options. You’ll need to live within commuting distance if you want to pursue this certificate. Once you complete the certificate course, you can choose to continue into a second year to get your AAS in Integrated Media: Graphic Design. The certificate program will teach you how to think critically and creatively to solve design problems. The program will help you learn to adapt to new and changing technologies. You’ll learn to communicate effectively, both orally and through written word. The program will teach you how to effectively collaborate, as well. The Certificate Program begins in the fall, starting in the spring is not supported or permitted. In order to continue from your fall term into your winter term, you need to be doing well in your courses and have permission from your faculty program advisor. You’ll take courses like Principles of Graphic Design, Basic Vector Illustration, Basic Sound Editing, Color and Composition, Web Basics, Digital Illustration, Typography systems, and a handful more. If you live close to Mt Hood Community College and want to get your feet wet in Graphic Design by attaining a Certificate, give the admissions office a call. Oregon State University has a great Graphic Design program. Oregon State University only lets about 25 students into its Graphic Design program, so it is highly competitive. They don’t keep the admissions number low for no reason, either. The small class environment makes for a rigorous, challenging undergraduate program. There’s no hiding in the background and skating by in this course. You’re going to have to earn your spot, and work hard to keep it. Your time in the Graphic Design program at Oregon State University will see you highly prepared for a competitive professional career. You’ll be able to approach careers in web design, app design, interaction design, interface design, motion graphics, and a lot more. At Oregon State University you can expect courses in art and design, digital communications, and new media. The Graphic Design program also includes a course on collaboration, a great skill to develop. As noted in the “Degrees Offered” section, you’d enroll as a Visual Communication Design major, but you can choose Graphic Design as a concentration. The Visual Communication Design course actually features three concentrations: Graphic Design, Video and Animation, and Interactive Media. You can expect to learn foundational art courses in the beginning. From there, you’ll explore typography, digital image fundamentals, and photography. As your visual communication design skills grow, you’ll collaborate on projects not just with other students and other groups on campus, but with the nearby community as well. This is a great approach to prepare you for the social aspect of your real-world graphic design role. Located in Monmouth, Oregon, Western Oregon University is a relatively inexpensive public school. Residents of the state can expect to pay just over $5,000 for tuition. For non-residents the 12-credit-hours-per-semester tuition cost climbs to just over $12,000. George Fox University is located in Newberg, Oregon. The graphic design path is actually one of three concentrations in the art and design major. At Fox you can expect a curriculum that nurtures your artistic talent and creative spirit. The course will get you ready for a professional career as a graphic designer, or prime you for graduate work if you’d eventually like to teach. You can expect traditional art and design coursework at Fox. They host classes on print design, computer graphics, web design, illustration, package design, advertising, and more. Your time at Fox will be spent addressing current visual design problems, and using your creativity and talent to come up with solutions for these modern issues. Two great things about George Fox University and the Art and Design program are the reasonable class size, and the practicing professors. Many of the professors in the graphic design concentration still do work in the field, they’re still actively designing. This is invaluable in making sure the curriculum is relevant to what you as a student will experience when you graduate. The smaller class sizes mean you develop a close-knit community. The professors know you by name. Plus, you’ll have a great network of Graphic Designers when you graduate; fellow alumni can vouch for you and your skills, and vice versa. Companies like Disney, Nike, and Bank of America have hired art and design majors from George Fox University. An undergraduate education can cost upwards of $32,000 dollars from tuition alone. Even though it’s one of the more expensive schools on the list, George Fox University will bring real value to your graphic design career.